Universal Newsline - Business, Lifestyle, Entertainment : ASCIonline App for Ads to fall in-line! iTunes for iOS users - https://itunes.apple.com/in/app/ascionline/id973395491?mt=8. 1. Lodge complaint: Lodge complaints by simply providing advertisement details and objection. Users can also attach the files like image or video or YouTube link of that advertisement. 2. History: Check the history of all previously registered complaints with the latest status and all other details. 3. 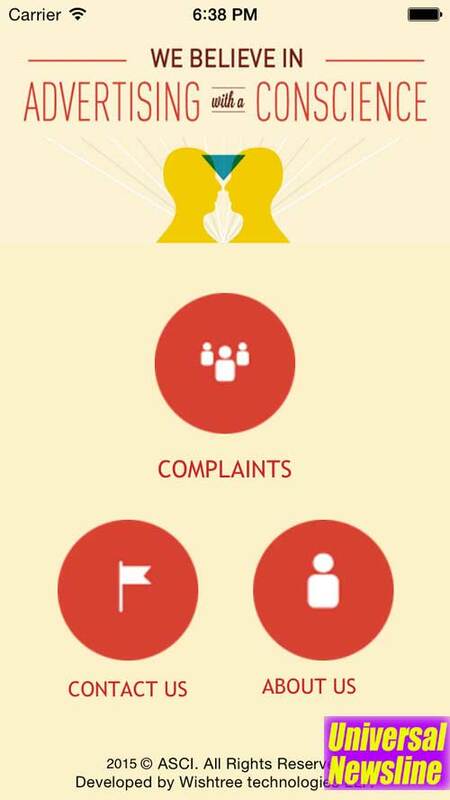 Complaint Tracking: Simply track the status of the complaints by providing the tracking code of the complaint. 4. Manage profile: Manage profile and contact details. 5. Push Notifications: Receive the automatic push notifications when status of your complaint gets changed. 6. No need to Login/Logout: It’s always on and connected. The Advertising Standards Council of India is a self-regulatory organization for the advertising industry. Established in 1985, ASCI’s role has been acclaimed by various Government agencies. ASCI is recognized under ‘The Cable Television Network Rules, 1994’ which states that ‘No advertisement which violates the Code for self-regulation in advertising, as adopted by the Advertising Standard Council of India (ASCI), Mumbai, for public exhibition in India, from time to time, shall be carried in the cable service’. ASCI is now the “Executive Arm” of the Department of Consumer Affairs handling all complaints pertaining to misleading advertisements. The Role and Functioning of the ASCI and its Consumer Complaints Council (CCC) is in dealing with Complaints received from Consumers and Industry, against Advertisements which are considered as False, Misleading, Indecent, Illegal, leading to Unsafe practices, or Unfair to competition, and consequently in contravention of the ASCI Code for Self-Regulation in Advertising.